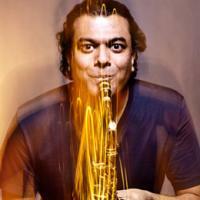 This Week in the Jazz Department: Musician's Show With Rudresh Mahanthappa! Tune in on Wednesday evening (April 11th) from 6-9 pm as the incredible jazz alto saxophonist and composer Rudresh Mahanthappa joins us and hand selects some of his favorite Jazz, Indian classical, and Rock recordings past and present. Mr. Mahanthappa will also discuss his new funk-based Steve Coleman-inspired project Samdhi, which melds the mindblowing polyrhythms of Indian Classical music, with the jittering textures of Electronica, and the hard driving pulse of Funk. Studying saxophone at Berklee and later Depaul University, Rudresh was quickly heralded as one of the most compelling and innovative voices on the saxophone. Rudresh has received awards from Downbeat Magazine as a Rising Star Alto Saxophonist, and from the Jazz Journalists association as Alto Saxophonist of the year. Rudresh currently leads or co-leads a number of projects, including the free jazz inspired "Apex" collaboration with legendary saxophonist Bunky Green, as well as his own quartet of original music. Rudresh explores the boundaries where Jazz and South Asian classical music meet with his Indo-Pak Coalition, featuring Rez Abbasi on guitar and Dan Weiss on tablas. As a sideman, Mr. Mahanthappa has recorded with such luminaries as Jack DeJohnette, Vijay Iyer, Rez Abbasi, and Danilo Perez. Tonight, Rudresh will focus on his revolutionary electro-acoustic group Samdhi, which has an album coming on September 27th, as well as a concert at Carnegie Hall on April 21st. Join us tonight for this eclectic and captivating set of music as Rudresh Mahanthappa discusses his own work and some of the players and musicians that have informed his own music.